Traffic in big cities increasingly congested. In the hours people go to the office in the morning and come home from the office in the afternoon, traffic congestion is inevitable. Not only that, the parking lot in big cities are increasingly limited, especially in the city center. Look for the parking area to park the car is a tough job. During this time, a small motorcycle or scooter with an engine capacity of 50-70 cc is a favorite choice for traveling short distances in a big city. For example, a trip from home to the campus, from home to the nearest minimart, or from home to the office adjacent. However, when the rain was falling, or in winter when temperatures can drop to near zero degrees Celsius or below zero degrees, riding a motorcycle is definitely not an option. Toyota Motor Corporation is fully aware of that limitation. That is why, two years ago, the beginning of March 2013, at the Geneva Motor Show, Toyota Motor Corporation introduced the i-Road vehicle city of the future, which is expected to eventually replace the role of a small motorcycle or scooter. Not long after being introduced at the Geneva Motor Show 2013, Toyota Motor Corporation made 20 prototype i-Road to be tested (test drive) in the streets of Tokyo and similar vehicles tested in Grenoble, France. 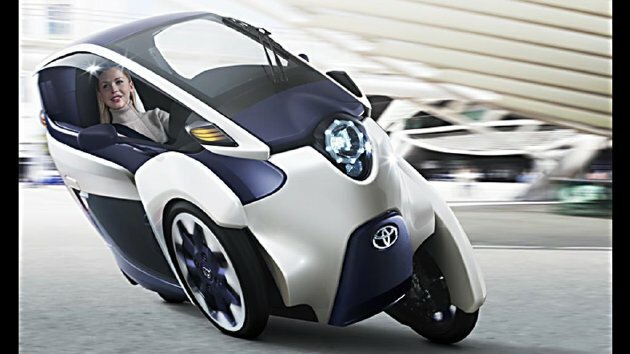 Toyota Motor Corporation called the i-Road as a combination of a car with a motorcycle. Therefore i-Road measuring 2.345 meters long, 0.870 meters wide and 1.695 meters high it has the agility of a motorcycle and the comfort and safety (stability) of the car. That said, i-Road was a three-wheeled motorcycle (two wheels in front and one wheel in the back) are closed like a car. Therefore closed, i-Road riders do not need to wear a helmet, do not get wet when it rains and not to worry because the i-Road can not fall due to slipping or cornering too low. That is why, anyone can drive i-Road. Does not require special skills. Handlebar (steering wheel) i-Road connected to the rear wheels. And, when turning to the left or to the right, two front wheels will bend skewed independently and simultaneously, like a skier's legs when turning at high speed. Equally tilted to the left or right, but the outer wheel position is higher than the wheel in that position i-Road became very skewed, like motorcycle racing is being banked. Although i-Road impressed drove very fast, in fact the highest speed is mediocre, only 60 kilometers per hour. I-Road position very tilted when cornering, similar to the position of motorcycle racing cornering at high speed, making driving i-Road feels very fast. Each of the front wheels are driven by electric motors powered 2.7-PK are getting power from a lithium-ion battery. In a state of full charge, the i-Road can travel as far as 50 kilometers. And, because it uses electricity as a driver, i-Road did not issue emission (exhaust). How to control a simple and ease of obtaining land for parking make i-Road is suitable as a vehicle big city. When parking, the i-Road only require a half or even a quarter of the land required by a small car. That is why, i-Road-seat city car dubbed one. Toyota i-Road presented by PT Toyota Astra Motor in Gaikindo Indonesia International Auto Show (GIIAS) 2015 held in Indonesia Convention Exhibition (ICE), BSD City, Tangerang, 20 to 30 August 2015, immediately attracted the attention of visitors. The unique shape and supple movements make people interested to try it.